On Hackaday, we usually end up featuring projects using building blocks (components, platforms…) that can be bought on the market. We however don’t show many hacks that rely on basic physics principles like the one shown in the picture above. In the video embedded below, [nylesteiner] explains that copper oxide can be formed when heating a copper wire using a propane flame. When two oxidized wires are placed in contact with each other, an electrical current is produced when one wire is heated much hotter than the other. The trade-off is that the created thermocouple generates a small voltage but a ‘high’ current. However, when you cascade 16 junctions in series you can generate enough voltage to light up an LED. Even though the complete system isn’t particularly efficient at converting heat into electricity, the overall result is still quite impressive in our opinion. We advise our readers to give a look at [nylesteiner]’s article and blog to discover his interesting adventures. Still rather cool though, even more so because it seems extremely simple to replicate. I do wonder how long it would work; I’d think the bare copper would also oxidize, ruining the copper to copper oxide junctions. Would it be possible to do this with dissimilar metals? The voltage of these junctions is much higher than regular thermocouples (41uV/K for K-type), so it would have to be a combination of common metals with a sufficiently high voltage for a reasonable temperature differential to do this with a reasonable number of junctions in series. It seems managed to slip through my previous search. Sorry about that folks. Power one of the HaD web servers with the heat from his brow. I’ll let you know what Hackaday’s disciplinary council comes up with. He has to open AND drink a beer with a HaDuino. I really think it needs to involve the development of an opensource version of these. and then using the item on the offending party. And i forgot to attach my link… So i will start the development…. where did i put that disposable camera at….. I really appreciate that you politely point out that this is a dupe, then continue to leave a productive comment. Thank you! >When two oxidized wires are placed in contact with each other […] The trade-off is that the created thermocouple generates a small voltage but a ‘high’ current. So the summary is misleading the reader to think that created thermocouple = oxidized wires. You were just talking about copper oxide prior to that claim, but removed the references as to what the subjects of that claim is about! >The trade off is that the wire thermocouples can easily produce much more current than is easy to do with the copper oxide junction. Typically the copper oxide junction can easily produce hundreds of millivolts whereas a wire junction can easily produce hundreds of milliamps. No, actually it should be “an” as Mathieu wrote. ‘An’ is used before words whose pronunciation sounds like a vowel ‘ell-ee-dee’. Some people pronounce it as a word instead of spelling it. Usually people from countries that say ‘zed’ and ‘aluminium’. So anyone that isn’t American? i think this article should be removed. As long as they don’t make mistakes like this too often, it’s no big deal. And we’ve all got to have a lovely chat about thermoelectrics. The part that gets me is that, yes, it does work, but the tradeoff is degradation of the copper wire will require frequent replacements as its the oxidation process that frees up an electron. and even thou it is pretty cool as a demonstration, the cost of the fuel, propane, is far greater than the same amount of power coming out of a battery and far less cumbersome. I’d give it an B+ for concept and execution, but for practicality, solid D.
I give it an A+ for ‘stranded in the desert a need to power cellphone for emergency call’. 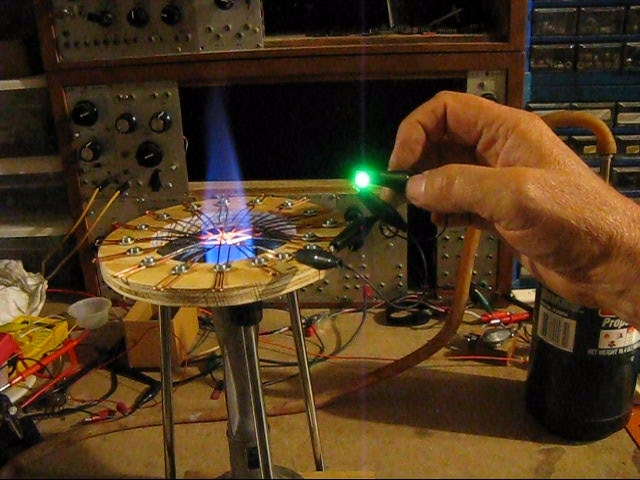 More probably, the propane torch would give enough power to completely desolder the Peltier. Oxidation process frees the electron, so does that mean that fresh copper has to oxidise to produce power? Using it up? So essentially then this is a battery! Hmm. Still there’s plenty of copper in the world. Not sure on it’s melting point, but you can always send the oxide off to be recycled, or even recycle it yourself if you fancied a challenge. Drawing wire might be difficult, but it wouldn’t have to be perfect wire for this application. >Oxidation process frees the electron, so does that mean that fresh copper has to oxidise to produce power? Since the circuit has to be completed for power to flow, those electrons simply passes through the external circuit and go back to the junction. May be it is redox reaction. One side of the copper loses an electron to become an oxide, but the other side the copper from oxide gains an electron and get reduced to copper. It is like electroplating except the temperature difference cause the electron to move instead of the battery. Is that the same Nyle Steiner as in Steiner-Parker? Nobody at all curious at the units in the back? It reminds me of a homebrew TM500 setup from tektronix. I liked reading it again,It got me thinking of building one of them. Not to piss in someone’s cornflakes, but this has been done before. Scientific American, before they went south, used to have an article section called “The Amateur Scientist” (I think) and I recall the exact, same setup being used to power a transistor radio. Gods, I feel old now. I recently needed to replace a water heater, and the control modules nowadays are electronically-controlled. There is an led on the front panel that flashes (a red one, VERY efficient) out codes to indicate operating mode. Still, bravo, gentleman. A+ for either creativity or research, D- for practicality. Doesn’t that mean that, if the supercap runs empty, and it can’t open the valve to start the pilot light (or generate the spark to light it), then it’s not gonna get any more thermoelectricity, and won’t be able to charge, leaving it useless? Does that mean they send an engineer round with a 9V battery? If that’s the case, while connecting a battery is something a user could do, gas-boiler maintenance of any kind is only legally allowable by qualified personnel. And only safe, really, the only permissible safety is to keep enthusiastic amateurs completely away from it. Maybe there’s a long-long-life battery in there as a backup, powering a tiny trickle-powered processor that occasionally checks the cap. Or maybe the pilot light stays on long enough to charge the cap if necessary. And the cap has a low enough self-discharge rate that it can survive for years if it needs to. Still it’d be a rare supercap if it can. Using the pilot thermocouple is a little stroke of genius, but I can’t help wondering about the drawbacks. Maybe there’s another big thermocouple somewhere in the heat exchanger for extra power, valves need to turn on and off quite a lot. I’d be interested to hear from any gas engineers. They sell parts to repair gas water heaters in hardware stores around here, so I assume DIY repair is still legal in some places. Still, licensed repairmen need to get components too. Often, in the case of plumbers and electricians, dunno about gas men, instead of ordering a part, if it’s a cheap one they’ll pop to the local hardware store and buy it retail. Even if it’s not a legal matter, I’d imagine your house insurer wouldn’t be happy to hear you repair your own gas boiler. They’d either want bigger premiums or refuse to insure, and gods help when the house burns down. With all the carbon monoxide and damp, even besides blowing the place up, it’s something I’d leave to a pro. It’s the things I’m unaware that I don’t know that are dangerous. The thermocouple runs at dull red heat and its primary purpose is to power an electromagnet to keep the pilot gas valve open. If the pilot flame goes out for any reason, the valve is unpowered and closes requiring manual intervention to open it again. If you’ve ever had to light a pilot flame you’ll remember having to hold a button in for up to a minute to get it to stay lit. This is the warmup time for the thermocouple. Sorry if this shows up in the wrong space, I’m responding to Greenaum’s comment. Wondered about that too. Even after you lit the pilot, it didn’t take off for a while. Had to “think about it”, probably the charging period. Additionally, it doesn’t have a traditional, spring-loaded gas valve, in fact it doesn’t have a valve at all. The “lite” sequence is you hold a lighter under the pilot and eventually the pilot emerges and takes over. I can tell the controller is electronic because the temperature controller knob isn’t mechanically laggy, it’s a potentiometer., way off the centerline of the control unit’s connection with the tank. isn’t the temp difference between the junction and the dissimilar leads whats generating the current (seebeck effect), and not the difference in temp between the two metals as the video is wrongly suggesting? Dunno. It’s kind of wierd to start with, since he’s claiming the thermocouples are operating in reverse-biased pairs. And why’s the voltage so high and the current so low, compared to normal thermocouples? This thing is a lot wierder than it initially seems. Some smart guy, go and look it over properly. What, 2, maybe 3 LEDs! You could light up your numberplate! Once the exhaust gets warmed up. OK, now call me crazy but if you put these thermocouples into a propane barbecue you could use it to charge your phone. 0) i believe they are TWO DIFFERENT LAYERS of oxide from before you ever assemble it. you expose each wire into flame temporarily. then you have to flake the black top layer off without damaging the red layer underneath on ONE wire, the other wire you need to keep both layers and contact only top black layer. when i say red i mean red, the copper-colour is not what im referring to. 1) not everyone has read this, everyone should read it at least once. 2) either read the article or look at the fullsize picture on the website. there are two lengths of wire for each junction, theyr two different temperatures. 3) theres a big difference between this and touching copper to another metal. the two metals are not copper and copper oxide. B) IT IS CALLED HACK-A-DAY, GET IT??? C) HACK, AS IN A NON-PRACTACL MOD. D) WE ALL LIKE IT THAT WAY. E) WE DONT WANT PRACTACL. WE WANT DIY SCIENCE! In fact, the wire is covered in many layers of different oxides which gradientally have less copper and more oxygen in their structure. By the way, you seem to be a pro user of Caps Lock key. …with increasing distance from the wire. Is that what explains the higher voltage? There’s a pile of many junctions on each bit of copper, and the junctions are between cupric and cuprous oxide? Cos the page has an explanation but the guy’s not entirely sure. I’d appreciate a nice clear explanation of this whole thing, it would be interesting to read. Is this thing stable? Cos it looks like it could revolutionise thermocouple power generation. The low voltage / many junctions needed has kept it from being much use in the past. But something like this might really help power generation in poor countries, charging a phone from a cooking fire or wood stove. What I want to know is, can we attach a buck converter to boost the current without adding too much additional stress? It comes from old Czech book on semiconductors from 1962. If you are interested and want me to post a translation, tell me so. First let me state that of now I have not been able to duplicate this. Not even close. But I do get some action and I have (briefly) gotten about .2V out of a junction under certain conditions that I am trying to fully understand. I am not accusing the author of lying or misstatements. I just think I have not been able to duplicate his work. One point worth noting is that one of us may be using oxygen free copper. One of us may be using contaminated copper (I know I have some contamination because I get a green flame when I heat the copper rod to create Cu2O. Some commentators suggest Cu2O (red) and/or Cu as a junction. Such would make the Seebeck effect controlling. I don’t think so. You end up with a reverse biased diode (Cu2O is a P type semiconductor, CuO (the black) is an N type semiconductor and any junction with Cu would form a Schottky diode preventing current flow until the bias is overcome). It is not likely the Seebeck effect. Some suggest the current comes from the oxygen giving up electrons. That is of course correct, but not in the slightest helpful. The question is why. Cu2O is one weird material. It is not Daltonian. Dalton said materials are comprised of integer numbers of atoms. Cu2O should have two copper and one oxygen atoms. It doesn’t. Its one of those materials which “miss” atoms. Its more like Cu1.8O. There are other materials that are not Daltonian, but not many. Cu2O is weird in other ways too. FYI: the fundamental idea of the experiment actually goes back to, omg, Franklin. It pops up over every 20 years or so and gets forgotten. It was re-discovered by Benedick about 1910.